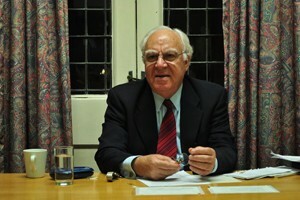 Farhang Jahanpour is a former professor and dean of the Faculty of Foreign Languages at the University of Isfahan and a former Senior Research Fellow at Harvard University. He is a tutor in the Department of Continuing Education and a member of Kellogg College, University of Oxford. This is the ninth of a series of 10 articles in which Jahanpour looks at various aspects and implications of the framework agreement on Iran’s nuclear programme that was reached in July 2015 between Iran and the United States, United Kingdom, Russia, France, China and Germany, plus the European Union. OXFORD, Sep 29 2015 (IPS) - Although some regional countries initially opposed the nuclear deal between Iran and the P5+1 (the United States, Russia, China, United Kingdom, France and Germany), once the Joint Comprehensive Plan of Action (JCPOA) was signed by the two sides in July 2015, practically all regional countries welcomed it. After the initial agreement in Lausanne, U.S. President Barack Obama invited all the Gulf Cooperation Council (GCC) leaders to a Camp David summit in May and all of them expressed support for the deal. After the nuclear agreement was announced, the United Arab Emirates and Kuwait both congratulated Iran and the Secretary General of the Arab League Nabil al-Arabi hailed the deal as a historic event which constituted the first step to rid the Middle East of weapons of mass destruction. He called on the international community to put pressure on Israel to get rid of her nuclear weapons. As the head of the Arab League he speaks officially for all the Arab countries. For his part, Obama has indicated that the region needs a new approach toward regional security. He said the Sunni Arab states shouldn’t blame Iran for all their problems, and he called on them to engage Iran in a “practical conversation” to reduce sectarian divisions and address shared threats from terrorism. Turkey, which has worked closely with Iran over many years to resolve the nuclear issue (in May 2010, Turkey and Brazil tried to broker a deal between Iran and the West), is also fully supportive of this agreement. This leaves Israel as the only regional country that still opposes the deal. With the very sensitive nuclear issue taken off the table, it is much easier now to deal with a number of critical regional issues. If the U.S. focuses exclusively on the agreement and does not test opportunities for collaboration with Iran on other issues, it may miss a historic opportunity to reshape relations with the Islamic Republic, as well as to usher in a new political and security order in the Middle East as a whole. Iran of course poses a number of challenges to U.S. interests in the region, and in many arenas American and Iranian interests seem to be fundamentally at odds. Chief among these disagreements are Iran’s policies towards Israel, Syria, Iraq, Lebanon and Yemen. Dubbed the “axis of resistance,” the Iran-Iraq-Syria-Hamas-Hezbollah grouping was supposed to highlight Iran’s commitment to the Palestinian cause. Iran is accused of supporting the Shi’a militias in Iraq to the detriment of the Sunni minority. Iran supports and arms the Bashar al-Assad regime in Syria, and is also accused of supporting the Houthis in Yemen. However, as the result of changed circumstances in the region none of these problems is insurmountable. As far as Hamas is concerned, after the civil war in Syria and the expulsion of Palestinians from that country, Hamas turned initially towards Turkey and towards the Egyptian President Mohamed Morsi. Since the coup in Egypt, Hamas has turned more towards Qatar and has even mended relations with Saudi Arabia. Therefore, hardly any links exist at the moment between Hamas and Iran. Hezbollah forces are fighting in Syria to support Assad’s government against ISIS, the al-Nusra Front and other terrorist groups. This is a cause that the West shares. With the flood of refugees towards Europe, many European leaders have realized that no matter how much they loathe Assad, he is preferable to the terrorists that pose a deadly threat to the region and even to the West. In a joint press conference in London, the U.S. Secretary of State John Kerry and the British Foreign Secretary Philip Hammond said that although Assad had to go, nevertheless, it might be necessary to talk to him as part of a deal over a transitional period. Neither Iran nor Russia has said that Assad should rule Syria forever, but they argue that first the terrorists should be defeated, and then Assad’s fate should be decided by the Syrian people in a supervised election. As far as Yemen is concerned, U.S. officials have admitted that Iran does not play any direct role in that conflict. In an interview with The New York Times in July, Obama said that Tehran had even tried to dissuade the Houthis from capturing Sana’a back in 2014. According to a report released on September 19 by Yemen’s Civil Coalition, over 6,000 Yemenis have so far lost their lives, and a total of 14,000 people have been injured, most of them civilians. The latest deadly stampede during the Hajj pilgrimage in Mecca, killing at least 717 and injuring over 800 with a few hundred people still missing, has added to Saudi woes. The combination of these tragedies, as well as growing domestic discontent, might persuade the Saudi rulers to turn towards diplomacy and regional cooperation. Turkey has recently softened her position towards Assad, and by placing its airports at the disposal of U.S. aircraft fighting ISIS, Turkey has shown that it takes the terrorist threat seriously. Recently, there have been some moves by the Russian President Vladimir Putin to form a security belt, including Russia, Iran, Egypt and Syria against ISIS. The response from the U.S. to Putin’s proposal has not been hostile. In the wake of their meetings in New York on the sidelines of the United Nations General Assembly, the U.S. and Russian presidents might reach an agreement over how to jointly tackle the menace of terrorism. During his recent visit to New York to take part in the U.N. General Assembly, Iranian President Hassan Rouhani said that ties with the U.S. had improved, but there was still a “long road to travel” before they could normalize their relations. Nevertheless, what we are seeing on the ground looks quite different. If the new rapprochement between Iran and the West is not to fizzle out, there is a need to broaden the scope of cooperation over regional issues. Recent developments have shown that there is an increasing possibility for new geopolitical alignments throughout the region. The growing menace of terrorism, Iran and the U.S.’s tacit cooperation in Iraq, Saudi Arabia’s growing problems in Yemen, Turkey’s shift to greater cooperation with the U.S, and now Russia’s greater involvement in the fight against ISIS show that all these countries have some shared interests in fighting terrorism, and establishing security and stability in the region through cooperation. The status quo in the Middle East cannot survive much longer. The winds of change are blowing throughout the entire region, and there is a possibility of new beginnings. This opportunity should not be missed.